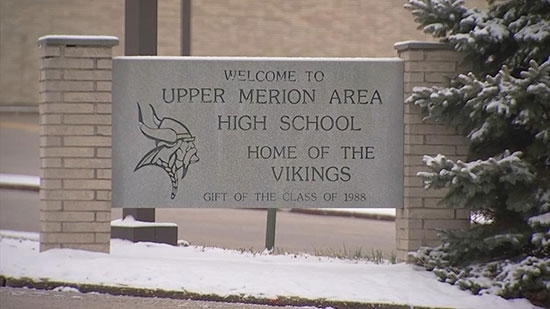 A online threat that caused Upper Merion Area School District to close all schools on Friday, 1/18, was traced to an anonymous poster in Canada. Upper Merion police say that a suspect has been taken into custody by authorities in Montreal. The suspect has not been identified. Police say that they do not know if the individual has any connection to Upper Merion or why they made the threat. Police do say they believe there is no active threat against the community. It started on Thursday evening, 1/17. School district superintendent Dr. John Toleno was informing the school community about the upcoming snow via Twitter. The threat came as a response to one of his tweets. It threatening gun violence against children at a school. Upper Merion police were informed and the FBI was contacted. Dr. Toleno considered having schools open with increased security and police presence, but after consulting with authorities the decision to close was made in the early morning hours. The suspect was arrested by Friday afternoon. A man is dead after being stabbed by his female roommate during an argument in their home in West Oak Lane. It happened after midnight on Saturday, 1/18, on the 6500 block of North 20th Street. The 29-year-old man had just returned from work when the two began arguing. The woman pulled out a knife and stabbed the man in the abdomen. The man was pronounced dead at the scene by medics. The man's significant other witnessed the entire thing and is cooperating with police. The woman is now facing murder charges. A man was shot and killed during a fight outside a club in Kensington early Saturday morning, 1/18. It happened around 3:30 a.m. on the 800 block of East Allegheny Avenue near Kensington Ave. Officers arrived to find the 29-year-old victim shot in the head. They tried to revive him. He was pronounced dead a short time later at Temple University Hospital. Investigators are reviewing surveillance footage of a fight after the club had closed. If you have any information, contact police. Many pro-sports stars' contracts are laden with performance-based incentives. Philadelphia Eagles QB Nick Foles was eligible for a $1 million bonus this year if 1) the team made the playoffs and 2) Foles took 1/3 of the snaps. Well, Foles led the Eagles on another magical run to make the playoffs after taking over for an injured Carson Wentz in December. He also played the first two games of the year as Wentz recovered from last year's knee injury. Foles ended up with 357 out of 1,092 snaps for 32.629 percent, just shy of the 33 percent needed for that bonus. He actually only needed 4 more snaps. Foles sat out the final 10 snaps of Week 17 against the Redskins with a chest injury. He came back the next week to beat the Bears in the first round of the playoffs. The Eagles have decided to give Foles that $1 million bonus despite being short on snaps.